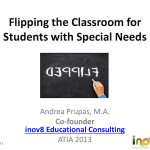 We recently presented our ideas and current work on “Flipping the classroom for students with special needs” at ATIA 2013. As we have posted previously, the flipped classroom has been making some big waves in the last year in both K-12 and in higher education. We’ve been working on this initative and wanted to share our resources so that we can generate ideas and discussion in this new and growing area. Essentially, flipping the classroom has enabled us to use new technologies to “do things differently,” such as using interactive screencasting for delivering content to students that they can pause and replay. However, we wanted to take it a step further to assess if technology is actually helping us “do different things” in our classrooms rather than just making our classrooms a little different. A great example of this would be using interactive screencasting for visual support and multi-modality learning and then focus classroom time on social skills training. Those used mainly for use inside the classroom (digital storytelling, blogging/microblogging, concept mapping). We enjoyed discussing flipping the classroom for students with special needs and the great feedback we received from our colleagues at the conference (ATIA is always a great experience!) Please post your thoughts below, we would love to get the conversation going! I hope you will excuse me for this comment on your blog rather than an email but I have created a new bookmarking site for parents of children with special needs. You can submitany links you like that are newsworthy to fellow parents. The site also automatically bookmark news stories and new posts from relevant bloggers. If you want your site to the auto bookmarking, just email me. I need your RSS feed. For wordpress sites it is [your domain name name]/feed. I have set up a special twitter account that will tweet all the bookmarks and news automatically. Please follow @forspecialneeds if you are interested.